We’ve all noticed that these days, there are more and more parents on our campuses. When students arrive at their college or university of choice, students are maintaining their connection with their parents. I’m sure we can all think of a few funny stories, where we’ve seen parents in the classroom or even the residence hall. But what does the evidence tell us about the influence of parents and family on the applicant’s decision to attend your institution? This is one of the influence questions addressed in Academica’s University/College Applicant Study (UCAS). When a recent US study concluded that older siblings have a strong influence on their younger siblings’ PSE choices, we were inspired to look back at the last few years of UCAS data to understand whether this holds true for Canada. One channel we’ve explored for several years now is the impact of recommendations by parents and family. Since 2008, we’ve observed a slow but steady increase in how important applicants say this recommendation is to them. 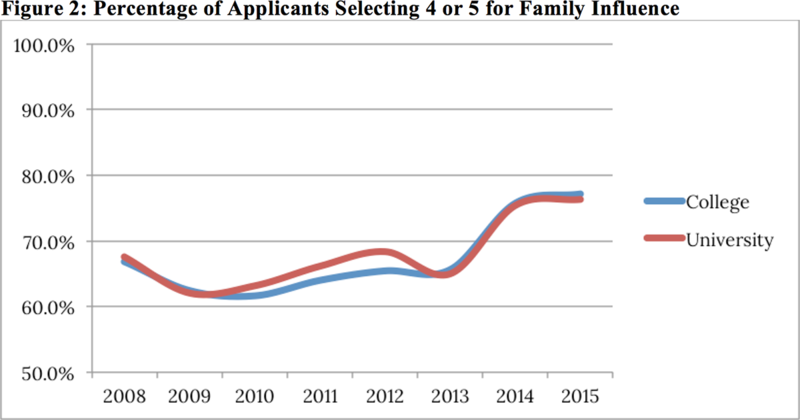 Seven years ago, the average importance for applicants was 3.9; this has risen to 4.2 for 2015, an increase of 6.9% (Figure 1; the axis has been compressed to emphasize the difference). This sounds like a small difference, until you compare it to the other channels. Over seven years, the trends for all marketing channels are generally steady: many channels only change a few percentage points. These changes, while subtle, can be very informative. To provide some context, we compare parent/family influence to the influence of the institution’s website. 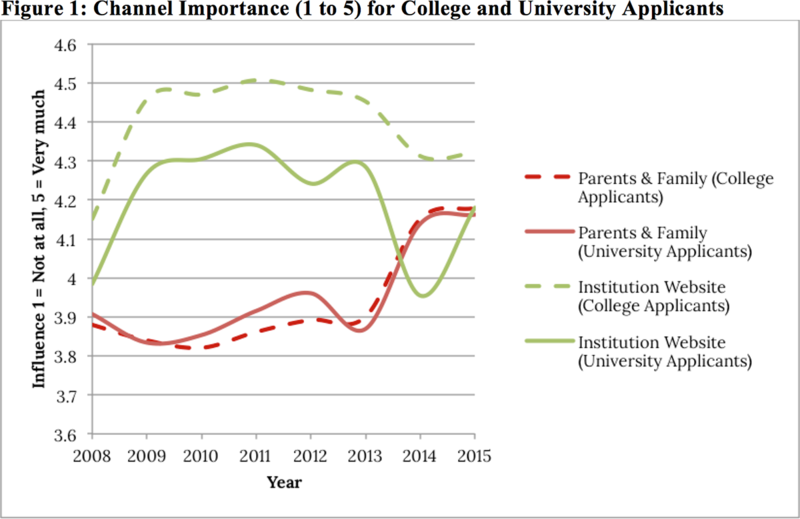 This latter channel is consistently one of the most important factors for an applicant, and yet, especially since 2013, its influence appears to be waning slightly. We suspect that this may be a result of the constant improvement of institutional websites over the last decade. Today, highly informative, user-friendly, and attractive websites are a given. We will explore some student feedback on key website trends in a future post here. Zeroing in on those applicants for whom this factor is particularly important—those selecting a 4 or 5 on the scale—we can see an even stronger effect. In our most recent data, from earlier this year, fully 77.0% of applicants said recommendations from their family had either “very much” or “quite a bit” of influence (Figure 2). This is up from just 67.3% in 2008, or a striking increase of 14.4%. However, over this same period, the number of students saying that they used their parents or family as a source of information has declined, from 54.8% in 2008 to just 28.5% in preliminary 2015 data. In other words, while fewer students may be relying on their families for information, those that do are relying more strongly than ever. Academica’s StudentVu, a national research panel of college and university students, can also provide some insight into the question of family influence. Whereas the UCAS data tells about why the applicant chose a given institution, what about why they picked their particular program of study? In other words, why did they decide to go to school to become an engineer instead of a nurse? In July 2014, we asked our panelists exactly this question. Overwhelmingly, they told us that it was their passionate interest in the field; career and income reasons rounded out the top three answers (Table 1). Yet recommendations from parents, family, or friends came in strong as the next most common choice. On a scale of 1 to 5, with 1 being “not at all” and 5 being “very much,” our panel gave this option a 2.8. This puts it above financial considerations and even above previous work experience in the program area. Fully one-third of students rated the recommendation of family or friends a 4 or 5, even when it comes to their chosen program. So why might this increase be happening and what are the practical implications? No doubt many of you have noticed an increasing consumerism among PSE prospects. Certainly the educated baby-boomers have inserted themselves into their children’s PSE selection process (those helicopter parents!) but we believe there are at least three broader trends contributing to this growing consumerism. First, students hear all kinds of rumors, true or not, about PSE graduates that cannot get jobs upon graduation, meaning, in effect, that PSE outcomes are less certain. Second, the number of choices facing students has steadily increased, as institutions now compete more aggressively with each other. Third, the costs continue to increase. Under this perfect storm of circumstances, increasing scrutiny by consumers is both natural and predictable. We think people are looking for information, which is one reason why rankings have grown in influence. And family and friends are a trusted source of information. Students are looking to hedge their bets: if their family has a good impression of an institution, that weighs even more strongly on their decision to attend. It also suggests that we can do more to tell an applicant’s family about our institutions. Word of mouth recommendations from alumni, rankings, campus visits, websites, and so on are all means by which institutions make an impression on family and the prospective applicant. But making an impression is not enough, it must be the right impression to encourage them to enrol.